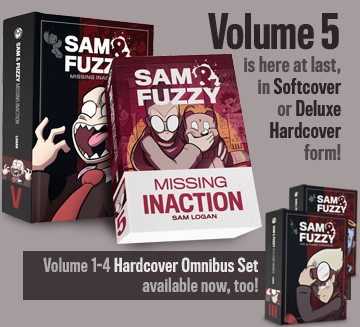 I'm actually not sure that anyone in Sam and Fuzzy is particularly genre savvy, although I'd be curious to know if you guys disagree or not. I think a big part of the comic... especially lately... is depicting characters with very different philosophies dealing with muddy situations where it's not entirely clear which (if any of them) have the right idea. Perhaps a good way of thinking of it is that these characters don't agree about which genre of story that they are in, and that each of them thinks they are the only one who is genre savvy. I do sometimes wonder about this myself. I think a lot of long-form cartoonists do, actually! Like, what if I get hit by a bus tomorrow? It seems unlikely, because I wasn't planning on leaving the house, but... what if a bus drives through my house? I do not have comprehensive notes or full scripts anywhere detailing how the story ends... it's all in my head! I've told Shannon the broad strokes, though. Ultimately I'm not sure it really matters. It's not like anyone else would step in to finish drawing it all for me. Long story short, uh... let's all just cross our fingers! I think Hazel was assuming that Fuzzy thought every caveworm he'd met was male, because none of them had obviously gendered apperances by humanoid standards. And, well, based on how Fuzzy responded, it sounds like that assumption was accurate, so I guess she just knows him pretty well! We return on Monday with our next strip. See you then, team! Running a little behind today, team... but here's today's comic! It is a pretty popular farm! Welcome to February, friends... an arbitrarily short month where you can't get quite as much work done and get the worst per-day value for your rent money. 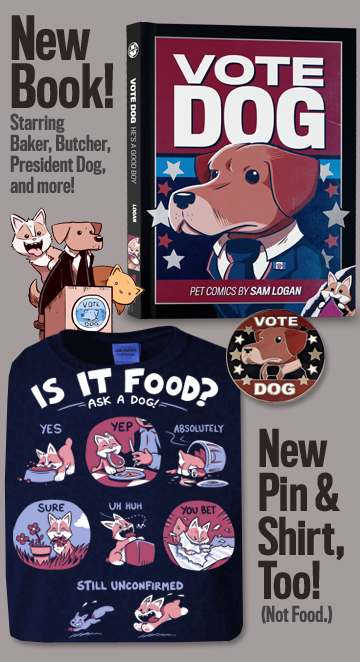 But at least it also brings some pretty exciting Sam and Fuzzy comics! Hope you enjoy 'em.